In this code pattern, we’ll use Jupyter notebooks to load IoT sensor data into IBM Db2 Event Store. From there, we’ll query and analyze the data using Jupyter notebooks with Spark SQL and Matplotlib. 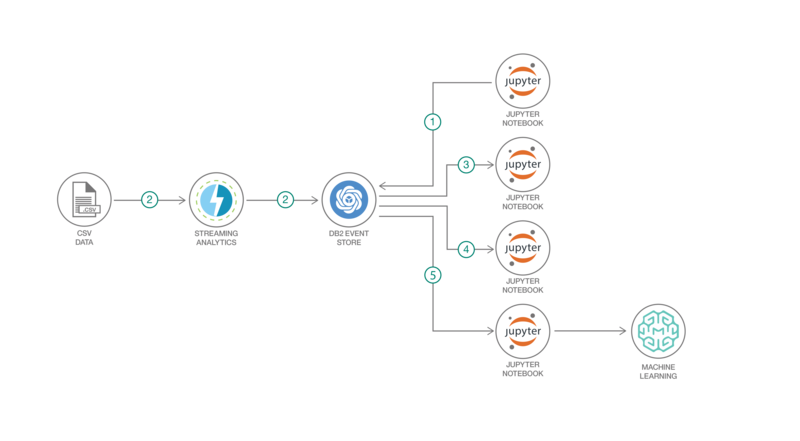 Finally, we’ll use Spark Machine Learning Library to create a model that will predict the temperature when given the power consumption and ambient temperature. This code pattern demonstrates the use of a Jupyter notebooks to interact with IBM Db2 Event Store — from the creation of database objects to advanced analytics and machine learning model development and deployment. The sample data used in this code pattern simulates data collected by real industry IoT sensors. The IoT sample data includes sensor temperature, ambient temperature, power consumption, and timestamp for a group of sensors identified with unique sensor IDs and device IDs. Db2 Event Store is an in-memory database designed for massive structured data volumes and real-time analytics, built on Apache Spark and Apache Parquet Data Format. The solution is optimized for event-driven data processing and analysis. It can support emerging applications that are driven by events such as IoT solutions, payments, logistics and web commerce. It’s flexible, scalable and can adapt quickly to your changing business needs over time. Interact with Db2 Event Store using Python and a Jupyter notebook. Visualize data using Matplotlib charts. Build and test a machine learning model. Deploy and use the model with Watson Machine Learning. Add the sample IoT dataset as a project asset. Create the Db2 Event Store database and table. Query the table using Spark SQL. Analyze the data with Matplotlib charts. Create and deploy a machine learning model. Install IBM Db2 Event Store. Add the sample IoT data asset. Create an IBM Db2 Event Store database and table.